Eddie is putting up an “Under New Management” sign. Harold sees it and insists they take it down – it's false advertising. Madge thinks he just doesn't want people to know that she's his new partner and she's a bit annoyed that he's ignoring all of her new suggestions. Des comes in and Madge asks him what he thinks - should they turn the coffee shop more into a restaurant. However, Des agrees with Harold – the extra staff would be expensive. 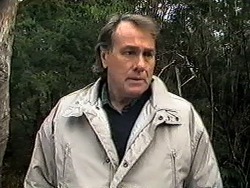 Des tells Madge the problems he's got at home – seeing as the builder has gone camping. They don't have a bath to use. Madge offers theirs and Des is very grateful. Joe wants to know why Bouncer's barking so much. Toby says it's because they've left him outside and separated him from Rosie. 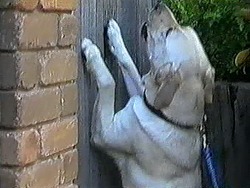 Kerry says Bouncer can is allowed out on parole but has to stay on his leash and Toby goes and fetches him. Kerry and Joe have a serious chat about adoption. Kerry wonders if it's a good idea for her to adopt Toby as well – so that he feels part of the family more. Joe agrees, but they're both a bit worried it'll upset him. Toby's walking Bouncer, who goes straight up to the gate where Rosie is and barks to her (she barks back). 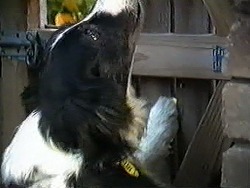 Toby threatens to take him home, and Bouncer comes away from the gate. Harold gets a bit irate about the laundry about the house. Eddie says it's Gemma's and he begins to get annoyed at “teenagers these days”. Eddie thinks he needs to relax a bit and not get so uptight – especially when it comes to Madge's ideas for the Coffee Shop. Harold thanks him and Eddie leaves. Harold takes of his cardigan and is about to fold it up but instead decides to be rebellious and tosses it onto the couch. 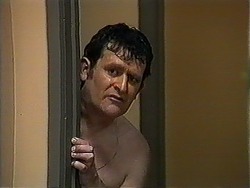 He then hears water running in the bathroom and calls out to Madge, smiling. 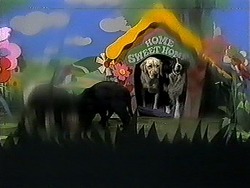 We see Madge coming in the back door. An undressed Harold goes into the bathroom. Harold runs out, he sees Madge. HAROLD: Madge?! ...What? What is going on here? No-ones had any luck looking for Jim. Doug thinks it might be time to get some real help. He's about to disappear when Jim pops his head out of the tent. He's been sleeping. 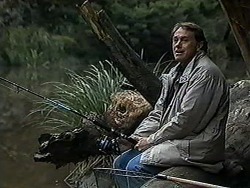 Doug suggests fishing – Jim thinks that's an excellent idea. Doug and Jim agree to see who can catch the biggest fish. 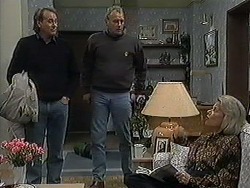 Kerry and Joe explain to Toby that Joe is going to adopt Sky. He's happy about that! Kerry says that she'd like to adopt him – but doesn't want to take the place of his real mum. They emphasise that it's upto him. Joe asks if he wants to ask about anything. TOBY: Do you think it's what mum would have wanted? JOE: Well, your mum and Kez were good mates. I reckon she'd be in it. It's up to you mate. 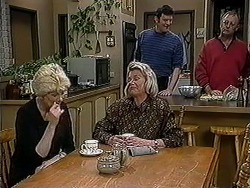 Madge and Helen are talking about Clarrie and about what happened with Des and Harold earlier. Des comes in asking if Jamie can use their bath because he's making mud pies. Harold is unhappy – they've already had Matt spread grease around the bathroom. Helen offers her place instead. DES: Does it have a lock on the door? They all laugh. 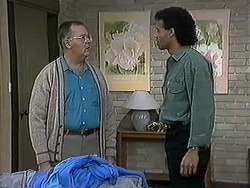 Des hopes that Jim doesn't feel the same way about water preservation as Harold does! Jim is teaching Todd to fish. 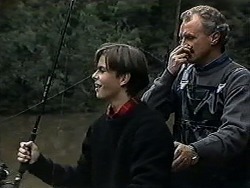 Doug catches a big one and Todd leaves Jim (who just told him that it's great to spend time with one another) to help Doug. Jim looks a bit jealous. Kerry is sorting out their tapes, wishing that Joe would label them. She comes across their wedding and her, Toby, Joe and even Bouncer all watch! Kerry reckons Toby looked very handsome in his suit. 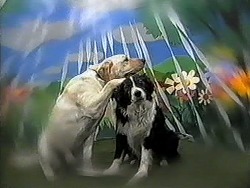 When, on the tape, Joe and Kerry kiss Bouncer barks. 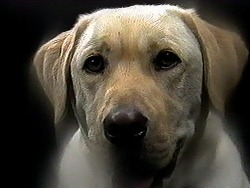 Toby thinks that things between Bouncer and Rosie are serious – all Bouncer does is dream about her. 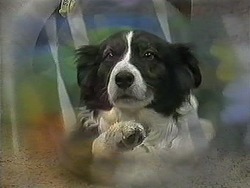 JOE: Dogs don't dream, Tobe. 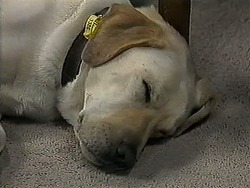 If he did I reckon he'd dream about a big juicy T-bone. 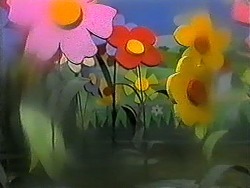 Bouncer sees Rosie and lots of flowers and the two of them together and mini Bouncer puppies with their own kennel. All to music which sounds like it should have been in Trumpton. Cody, Todd, Jim and Doug walk in. Helen asks how they got on and Doug admits defeat in the fishing - Jim caught the largest. Doug wants them all to go out for dinner, but Jim insists he has to see Beverly. The rest of them go and Jim looks peeved. 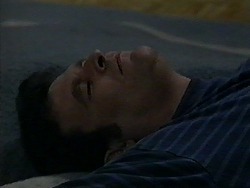 Helen asks him what happened. Jim explains that he couldn't do a thing right all weekend apart form the fish, and Todd thinks Doug is great. JIM: Suppose I'm just being petty. JIM: Yeah well, when Doug's in the room, Todd can't even see me. Kerry and Toby talk about Bouncer. 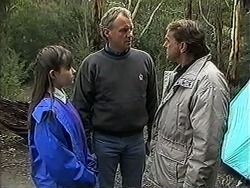 Toby thinks Bouncer's going to be really sad when Clarrie takes her away back to the country. He moves over to sit next to Kerry. Kerry thinks he'll be OK – he's got all of them to look after him! Kerry thinks it might be bedtime though. TOBY: Can I stay up a bit longer, there's something I want to watch on telly..pleeeaaaaease...! TOBY: Is it alright if I call you mum from now on? KERRY: Oh Toby. Oh, you bet it is. Nothing would make me happier. 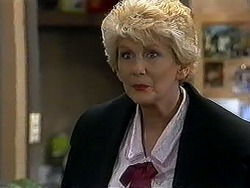 Madge turns off the TV, much to Eddie's disgrace (he was about to find out the murderer!). She suggests to Harold that they try something new at the coffee shop – a bottomless cup of coffee. Harold reluctantly agrees. Eddie puts the TV back on – it's finished! Joe and Kerry talk. Joe thinks that they're really becoming a family now, and it was so good to hear Toby call Kerry mum – he's accepting things. Joe thinks he's really lucky and tells Kerry that she means the world to him. They're both looking forward to a couple of days together though in the Lassiters' Hotel (the darts prize that Joe won) especially as there won't be much of a break when the new bub arrives. 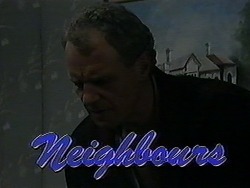 Joe gets up to see to a howling Bouncer and Kerry smiles. Jim is creeping about with a torch, thinking he's heard a burglar. He hits someone hard with a golf club and then turns on the light to see its Des on the floor. Uh oh!